Self propelled Rider with 4-stroke engine HECHT with displacement of 196 cm3, steel chassis. Central adjustment of cutting height. Working width 61 cm and recommended area 1500 - 2000 m2. Equipped ball bearings. 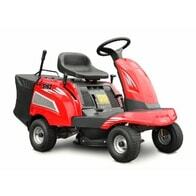 Self propelled Rider with 4-stroke engine B&S serie 850 with power input 6,5 HP, steel chassis. Central adjustment of cutting height. Working width 62 cm and recommended area 2000 - 2500 m2. Equipped ball bearings. Garden tractor with a 4 stroke HECHT OHV engine. Centrally adjustable cutting height. Recommended mowing area 3000 - 4000 m2. Ball bearings. Only side ejection. 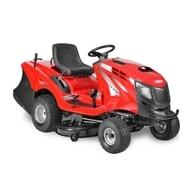 Hydrostatic self propelled lawn traktor (steel chassis) with 4-stroke engine INTEK OHV. Central adjustment of cutting height. Recommended area 2500 - 3000 m2. Eguipped ball bearings. Hydrostatic. 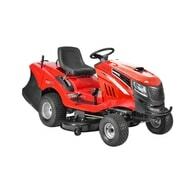 Lawn tsractor, working width 102 cm, engine BRIGGS & STRATTON PROFESSIONAL. 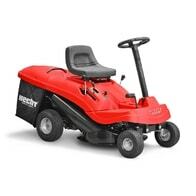 Suitable for mowing large areas and football fields. 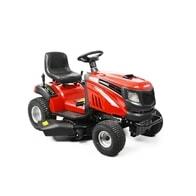 Garden tractor with engine BRIGGS & STRATTON INTEK OHV. Shot 112 cm. Tray 270 l. Weight 235 kg.